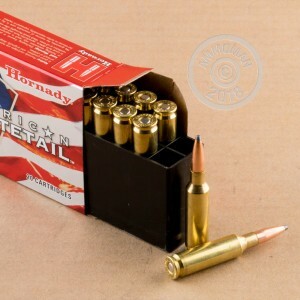 While the freezer won't fill itself, the task will certainly go more smoothly when you load out with these hunting rounds from Hornady's American Whitetail line. Each 6.5mm Creedmoor cartridge is designed to compliment your high-grade rifle with remarkable performance and trustable components. Parts used in assembly include clean-igniting Boxer primers, reloadable brass casings, and Hornady's own proprietary powder which is known for burning up completely with minimal residue left behind; this effort helps you get the most accurate fouled bore shots possible before your rifle is due for its cleaning. 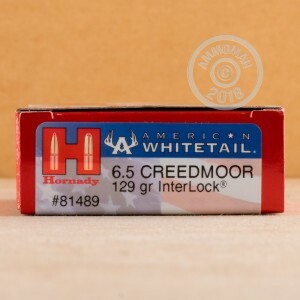 The ammo plays host to Hornady's InterLock projectile which is a soft point round with two measures that bind its copper jacket to its lead core: a low-position InterLock ring at the inside of the base and a knurled cannelure at the crimp point. The cannelure also prevents setback from causing catastrophic malfunctions and keeps the bullet from shifting under recoil and decreasing accuracy. At 129 grains, the projectile is appropriate to the caliber and offers great terminal energy when it penetrates and expands in a deer, coyote, or small boar. 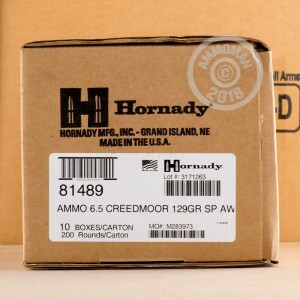 Hornady's ammunition is made with American ingenuity and refined using lessons learned since 1949.